File Types: PSD, All Files; File Size: 2.16 MB; Layered: Yes; DPI: 150 DPI; Vector: Yes; Dimensions: 851 x 315 px. This is a Premium Facebook Cover Template, Full layered, Named, Vectorized and super easy to edit, that means you can download it now and get your super awesome facebook cover in minutes! 1 PSD Facebook Cover Template File 1 Help file with fonts. Models and Photos not included. Keywords: agency, band, color, concert, cool, cover, creative, facebook, fb, festival, graphic, indie, monster, music, new, nice, professional, rock, slider, social. Best ddsign template, vectors, illustrations, video templates from creative professional designers with After Effect, PhotoShop, 3DS Max, Cinema 4D or InDesign. Full details of CreativeMarket 50% OFF- Indie Rock Concert FB Cover 550627 for digital design and education. 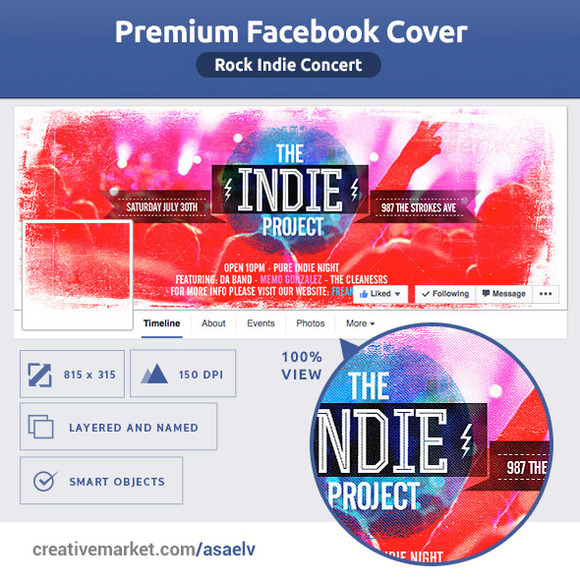 CreativeMarket 50% OFF- Indie Rock Concert FB Cover 550627 desigen style information or anything related.